When Santa Claus delivered presents and Christmas cheer to the families of Bermuda’s lighthouse keepers in the 1950s, he didn’t arrive in a flying sleigh pulled across the heavens by reindeers—he came by aircraft. The endearing tradition of the New England Flying Santas, started in 1929 by a Maine seaplane pilot as a gesture of appreciation to the lighthouse keepers, lifesaving crews and their families who stood vigil along the East Coast, is still being celebrated. On Christmas Day, Capt. Bill Wincapaw would take to his plane and drop packages of holiday treats for the dedicated folks at these isolated outposts. 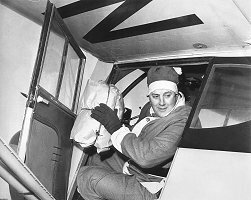 By the mid-1930s, he covered as many as 91 lighthouses and Coast Guard stations throughout Massachusetts, Rhode Island and Connecticut—parachuting gifts to isolated, lighthouse families. The tradition was carried on for many years after Capt. Wincapaw’s death in 1947 by maritime author and historian Edward Rowe Snow [pictured], who expanded the programme and visited St. David’s and Gibbs Hill lighthouses in Bermuda as well as stations off the US West Coast. Using helicopters now, Friends of Flying Santa still stops at many of the same lighthouses and stations visited by Capt. Wincapaw more than 80 years ago—although Bermuda, with its now automated lighthouses, is no longer on the route.